We’ve had a pretty uneventful week in a good way. I might be a little controlling and overzealous, but I’ve started preparing things early! This week we ordered the stroller, car seats and cribs and I bought two adorable bouncy seats! I decided that I should start doing things while I have the energy and then maybe I’ll be able to coast through the last part of pregnancy without stressing (yeah, right). I had an appointment today. Good news: I GET TO STOP PROGESTERONE! After 70+ intramuscular injections of progesterone alone, I’m OVER it! I must admit that I’m a little nervous to stop it, but Dr. C says if the placentas aren’t doing their jobs by now, progesterone supplementation isn’t going to help. Still no lifting anything more than 10lbs. I was made aware that this restriction would remain throughout pregnancy. (Say what?!? How do people with kids live?) I have a feeling this is one of the restrictions that doesn’t get followed well. I am being careful. My mom told me today that my purse was too heavy. I think I responded with something like, “??????!!!!!#####*******”. Also during Dr. C’s Debbie Downer speech, she told me that I couldn’t go to Singapore later this month. At first she was on the fence about it. She asked me why I was going and I told her to tag along with my husband and lay on the beach. She didn’t like that answer. She said that if it wasn’t vitally important to go, she’d tell me no. She says textbook says yes but she and the money, time, blood, sweat and tears it’s taken to get here says NO. I was concerned with how big my belly had gotten and continues to get daily. She said, “I’m not sure if you’re aware how pregnancy works. There’s actually something growing in there and with you- it’s two!” Funny, funny! She didn’t sympathize with my size concerns, needless to say. She says I’m right on track and measuring 20 weeks. Yikes! Precautionary genetic ultrasound (nuchal translucency screening) on Friday since we are having twins, and it was IVF. As always, I’m looking forward to seeing our little plums. How far along: 12 weeks and 4 days today. Maternity clothes: A mixture. Maternity pants, for sure.Still wearing non-maternity skirts, dresses, etc. Stretch marks: Not yet. Itchy though! Sleep: Sleeping pretty well! Still only up 1-2 times. Best moment of this week: Getting to spend time with W and getting the OK to stop progesterone! Miss anything: Still the same. Exercise, being able to lift things, alcohol, **Jimmy Johns**, cold lunch meat in general, bleu cheese and caffeine. Movement: Not yet! I can feel hard lumps where they are laying and I swear I’ve felt a couple of flutters, but nothing consistent. Anything making you queasy or sick: Not eating enough, or quickly enough! Have you started to show yet: Ohhh yes. Genders: Too early to find out. Happy or moody most of the time: Happy! Happy! Happy! Looking forward to: Our next official ultrasound on 5/16! Symptoms: Same as the last update: Exhaustion, some heartburn, and headaches. Just a tiny bit queasy off and on. I wouldn’t call it morning sickness though. I find that I’m able to eat less and less without feeling completely stuffed. Lots of grazing days in my future! 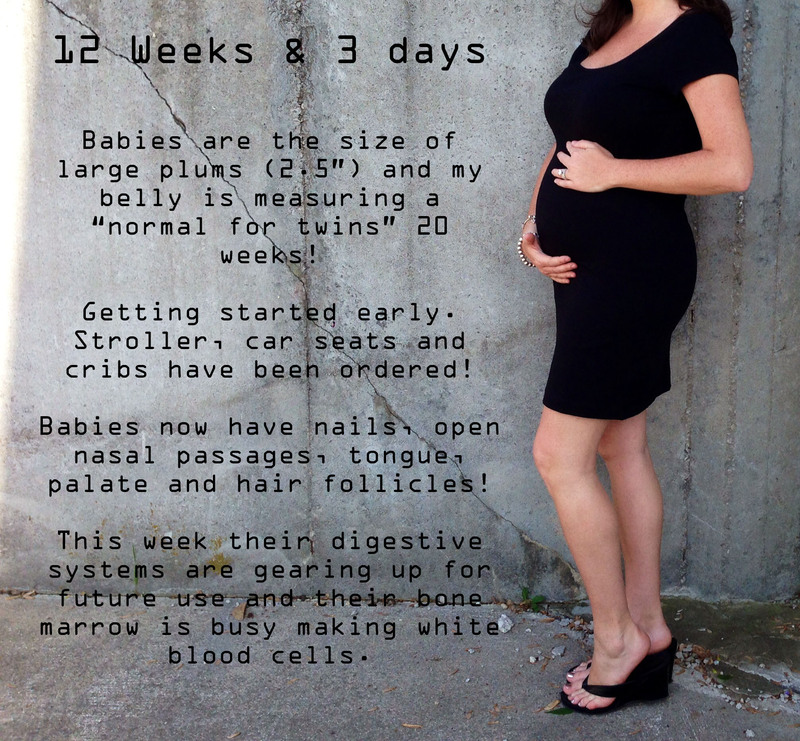 This entry was tagged 12 weeks, infertility, IVF, PCOS, Progesterone, Twins. Bookmark the permalink. You look adorable! Congrats on the end of the PIO!!!!! Oh my gosh! I literally lied through my teeth each time they asked if I wanted to switch to suppositories and said I could bare a few more weeks of shots. Bless your heart! Onto more happy baby moments!! Your bump is adorable!! Jeez 10 lbs? I bet my purse is too heavy too, lol, sorry you’re not able to go on that trip with your husband. But it’ll be nice to stay back and relax a bit! wow how exciting! love your updates gives me something to look forward to! Very excited for you! And props to you for doing your progesterone shots yourself. I’ve done all but these myself, and I’m still not sure I could force myself to stab the huge needle in. I’ll be thinking of you Friday at your ultrasound, hoping all is well! Congrats : ) You look amazing! 2 Babies, 46 NICU Days and 1 Happy Family!